On midnight May 21, 56-year-old legendary rapper and reality star, Flavor Flav was pulled over by the Nevada Highway Patrol. He was driving at 73-mph, in a 45-mph speed zone. Flavor Flav is now under arrest for driving under the influence, possessing less than an ounce of marijuana, having an open container of alcohol in his vehicle, and driving with a suspended licenses and registration, authorities said. They arrested him on all six charges, but posted a $7,000 bail shortly after. Flavor Flav, formally known as William Drayton Jr., is known for being a member of the politically conscious hip-hop group Public Enemy. 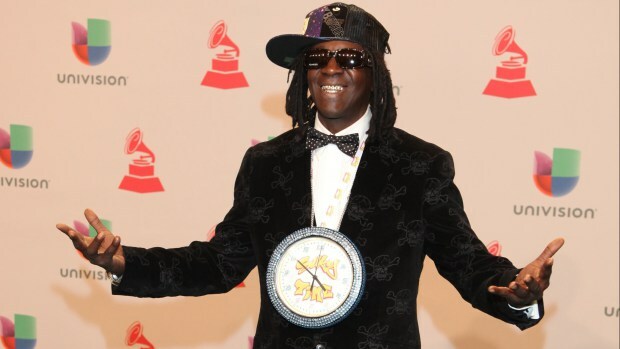 Flavor Flav was known as the notorious hype man wearing large clocks around his neck, big hats, and big glasses. Some of Public Enemy’s hits include “Fight the Power” and “It Takes a Nation of Millions to Hold Us Back,” which turned the group into mainstream stars. With tensions rising to an all-time high with group member Professor Griff, Drayton ultimately decided to become a solo artist. After leaving the group and beginning his solo career in the 1990s with the single “911 Is A Joke,” Flav was brought back into the limelight, but not for long. Once his reality television career concluded, Drayton stayed relevant in celebrity news because of legal troubles. In March 2014 he pleaded guilty to a domestic violence case after threatening his girlfriend of several years son with a kitchen knife. This case was reduced to a misdemeanor charge and Drayton agreed to probation and counseling in order to fulfill his legal consequences. The rapper is also facing a felony charge of driving with a suspended license in New York after being pulled over in January, 2014 on his way to his mother’s funeral. If convicted of these charges he will face up to four years in prison. Drayton’s attorney, Kristina Wildeveld, had no comment regarding his recent Vegas arrests, but did say she is working diligently to fix his ongoing case in New York that also involves driving-related charges.